Most of the mistrust emanates from opponents of the special-interest driven transit sales tax increase. Anti-taxers are certain that the referendum, bankrolled by Tampa developer Jeff Vinik, will fail with a legitimate count. There are questions about the manufacturer of the voting machines used in Hillsborough, Latimers’ motivations and track record, and Vinik’s influential reach into public officials, government agencies, media entities, and anyone with the expertise in skewing voting results. He prefers Dominion brand voter machines, which are more reliable and less likely to be hacked. Sancho expressed “no confidence” in ES&S machines, the ones in Hillsborough. Articles in the national press indicate some real, documented problems in voting procedures. In a February 2018 article in The New York Times, Kim Zetter reported that remote-access software had been found on an election management computer system used in Pennsylvania, and quoted unnamed sources saying "ES&S has in the past sometimes sold its election-management system with remote-access software preinstalled," and that this was used by ES&S technicians to remotely access the systems via modem to troubleshoot and provide maintenance to systems they sold. In a letter sent to U.S. Sen. Ron Wyden, D-Ore., in April 2018, Election Systems & Software made the disclosure that in fact “some” of the elections management systems they sold for voting did have remote-access software installed. This disclosure was made public in July 2018. The letter to Wyden had been in response to a question from the senator requesting clarification of the information on remote-access software in the New York Times article. While elections-management systems are not the voting machines voters use to cast their ballots, they are used to program the voting machines used in a county and to count and tabulate the results from the voting machines. By installing remote access software allowing the machines to be accessed via the Internet, the machines are vulnerable to being “hacked” remotely, allowing the counting to be altered surreptitiously, or malware to be installed to affect an election result. After the rancorous 2000 presidential election, a bipartisan Congress, passed the Help America Vote Act. It created the Election Assistance Commission, which it then deputized to test and certify voting machines. The act also allocated millions of dollars for election-infrastructure upgrades, much of which was used to replace traditional voting machines with computerized machines, like eSlate and the AccuVoteTS. Georgia, in fact, was the first state to adopt D.R.E. touch screens statewide. I'm in Hillsborough and we have paper backups and from your previous lying posts, not going to take your word...………………..And why haven't I heard about this before? ……...I think you are just making it up……………….Just why does Jim hammer on the Transit tax where the people get to chose, what is he, Brad so scared of?...………...People voting for what they want?...…………..Being able to get home without spending $20+?…………….Much of it goes to roads and buses so we'd actually get something resembling bus service in eastern Hillsborough...………..Now it is minimal, doesn't run much and not at night, barely on weekends..
You should be asking what Jeff Vinik is afraid of. His team leveled death threats against the NAACP for coming out against this transit travesty. You must be on pills or hitting the sauce. You are all over the map. There’s planty of backup in this article for any Hillsborough County voter to be concerned. You must be one of Lying Jeff Vinik’s paid puppets. 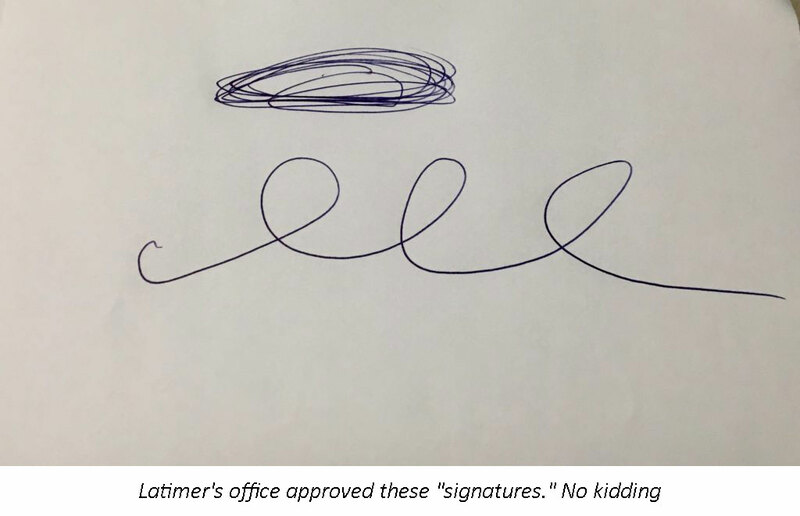 SIGNATURES: Basically, any mark made by the person - the uneducated simply "sign" with an "X". A signature does NOT mean "write your name" --- sad but true. You miss the point. Such marks render monitoring of the SOE impossible. His workers could have been instructed to approve any petition signature. A legible name can be checked against the voter rolls. Caveman drawings can’t. Election results in Florida have clearly been considered a crapshoot by many since the Election of 2000! Wrong - since Truman was president --- maybe FDR.